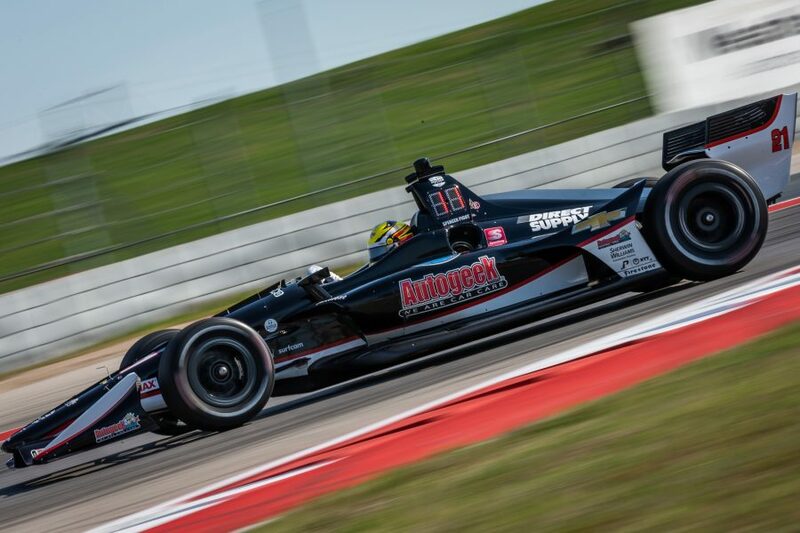 – The first NTT IndyCar Series race weekend at Circuit of the Americas ended up being an eventful one for Spencer Pigot. An unlucky qualifying session saw Pigot start near the back of the field, but race his way up towards the Top 10. An incident in the pit lane when another competitor sent out in front of him erased all of the day’s progress. However, a lucky break with the timing of the only yellow flag helped Pigot make up most of the positions he had lost. Pigot would finish 11th for the second race in a row. – The annual Spring Training for the NTT IndyCar Series moved to COTA this year, providing two days of testing for all drivers in mid-February. For Pigot, it was a chance to refamiliarize himself with the track as he is one of few drivers in the field who had prior race experience at COTA. He finished second in Race 1 of the Indy Pro 2000 doubleheader (formerly Pro Mazda) at the track in 2013. – Due to the 3.41-mile length of the circuit, Round 1 of qualifying was extended to 12 minutes versus the standard 10. Pigot spent his first lap in Group 1 on the Firestone Firehawks black tires building a gap, then jumped as high as 6th on his second lap. The No. 21 Autogeek Chevrolet headed back out on the alternate red Firehawks with enough time to complete one lap. He was tracking to advance to Round 2 when Jack Harvey slid off course three corners ahead of Pigot. The red flag came out, invalidating Pigot’s lap. – Because he did not have a chance to record a lap at speed on the red tires, he was forced to start the 60-lap race from the 19th position. He selected Firestone’s primary black Firehawks for their first stint with the goal of completing the race on the alternate red Firehawks. After the start, Pigot settled into 16th before making his first pit stop on Lap 7. – Once Pigot had a set of reds underneath him, he began to carve his way through the field. Just seven laps after he made his first pit stop, he had worked his way up to 12th after exiting the pits in 21st. He stopped again on Lap 24, this time opting for scuffed reds. On fresher tires, Pigot engaged in a spirited battle with Graham Rahal and Scott Dixon but with over half of the race left to go, he settled back into 12th and worked on hitting his fuel number. – On Lap 42, Pigot was heading to his pit box for his final stop of the race. The No. 7 car of Marcus Ericsson was released directly in front of Pigot, causing Pigot to miss his box. There was no damage to the No. 21, but the lengthy time in the pit lane cost him eight positions. Once he rejoined the field, he had fallen to 18th. – Not even two laps after the pit lane incident, the only full-course caution of the day came out. Since Pigot had already made their final pit stops, he was able to cycle forward as the leaders stopped. The No. 7 received a penalty for the unsafe release in front of Pigot, moving the Autogeek driver up another position. For the Lap 50 restart, Pigot took the green flag from 11th. While he was passed by one car on new tires, Pigot was able to get around his teammate Ed Jones with five laps remaining. Pigot took the checkered flag in 11th for the second race in a row. – Pigot will be on track next at Barber Motorsports Park for the third round of the NTT IndyCar Series season. On-track activity for the Honda Indy Grand Prix of Alabama will take place April 5 – April 7, 2019. The race will be broadcast live on NBC Sports Network beginning at 4 p.m. ET on Sunday, April 7.